Dr. Michael Fossel is the world's foremost expert on the clinical use of telomerase for age-related diseases. He was a clinical professor of medicine for almost three decades, and the executive director of the American Aging Association. He is author of the magisterial textbook, Cells, Aging, and Human Disease, and co-author of the bestselling The Immortality Edge. He currently teaches at Grand Valley State University in Michigan USA, and is working to bring telomerase to human trials for Alzheimer's disease. Dr Fossel has lectured at the National Institutes of Health and the Smithsonian Institution, and continues to lecture at universities and conferences throughout the world. He has appeared on Good Morning America, FOX, CNN, BBC, Discovery Channel, and regularly on National Public Radio. We are at the beginning of a scientific revolution. Dramatic life extension has moved from science fiction to real possibility. 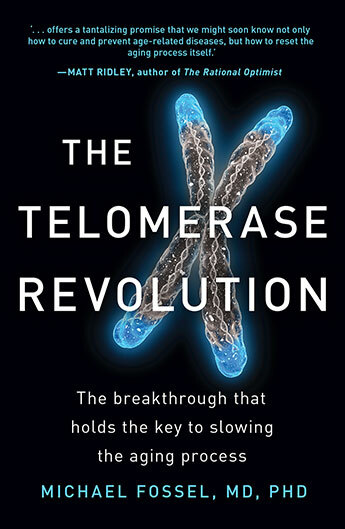 The Telomerase Revolution reveals the latest research on human aging and the enzyme telomerase which is starting to be used to slow the rate at which our cells - and we - age.